The UK’s current favourite jazz singer has released a heartfelt, if somewhat lacking, tribute to his idol Nat “King” Cole. Winter is coming. And with winter comes Christmas, and the opportunity to make a killing flogging novelty gifts. 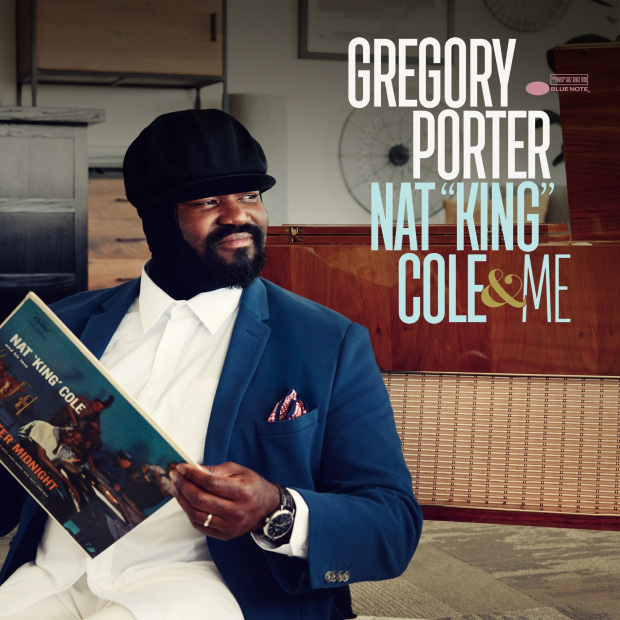 I had this in mind when it was announced that Gregory Porter, one of the great modern jazz singers and a two time Grammy Award winner, was set to release a tribute album dedicated to Nat “King” Cole. Perhaps I’m being too cynical. After all, in Porter’s defence, he has always spoken of his admiration for Cole, and in promotional videos and articles in support of his new album Porter has spoken about not knowing his own father growing up, and using Cole’s records as a substitute for a father figure. This album is then in part, it seems, an extension of that search for his own father, and something that Porter feels excited about doing. Yet the whole concept, at this point in his career, doesn’t feel right somehow. Gregory Porter: Nat “King” Cole & Me. Porter’s first two album on Montema Music, the gritty Water and the more romantic Be Good, were absolutely stunning. His next two albums on Universal Bluenote (Decca in the UK) showed a slight change in direction in Porter’s approach: his songs were shorter and more polished, therefore better suited to commercial radio play. The Liquid Spirit album sold phenomenally well for a jazz artist coming from relative obscurity, with the singles ‘Liquid Spirit’ and ‘Hey Laura’ featuring heavily on the BBC Radio 2 playlists. Porter became a crossover star in the UK, and would go on to win a Grammy for Liquid Spirit – becoming a household name, at least in the UK. Just last year he followed up Liquid Spirit with Take Me To The Alley, another great album featuring his jazz version of the Disclosure track ‘Holding On’. It was a surprise therefore that Porter would release another album in quick succession to Take Me To The Alley, which made the late October release a bit suspicious, given that in the literary world stock the shelves of Waterstones and supermarkets with naff autobiographies in October ready to flog to gullible Christmas shoppers. Again, maybe I’m being unfair. Porter undoubtedly loves the music of Nat “King” Cole, that much is clear from this album. Recorded in London with a mammoth 70 piece orchestra by Vince Mendoza, much effort has gone into this record. For casual fans there is the ‘standard’ version of the album, and for bigger fans of Porter there is a ‘deluxe’ version complete with ‘deluxe’ packaging. It’s clear a fair amount of time and money has gone into Nat “King” Cole & Me. Therefore it’s a bit of a shame that in places Porter sounds uninspiring (particularly on ‘Nature Boy’), as if going through the motions, forced into recording by his label to take advantage of his incredible popularity in the U.K. The first three songs feel a bit schmaltzy for Porter: the lush strings are at times too syrupy, and in places Porter is mixed low in the track, making it hard to pick out his voice once the orchestra gets louder. Why would you want to hide Porter’s incredible voice? Obviously, Porter and Cole have different voices: Porter’s is much more gritty (perhaps more like Nat’s brother Freddy Cole) while Cole had the most perfect combination of elocution and warmth. So it’s difficult to understand why Porter didn’t reimagine Cole’s songbook more, instead of sticking fairly quite closely to the original arrangements. Mendoza has done a fine job at producing the instrumental tracks, but it feels that he’s compensated by taming Porter’s voice somewhat. Take ‘L-O-V-E’ for instance: the orchestra is beautiful and the trumpet solo is a treat, but Porter hardily sounds excited. Again, I find myself comparing it to Porter’s past albums. Recording with an orchestra is new for Porter, and it took me a few listens to get used to it. There are some great moments on the album, and it does thankfully get better halfway through, providing enough moments to make it worthwhile to stick with the album. His version of ‘Miss Otis Regrets’ is given flare, with Mendoza’s dramatic opening and Porter’s excellent vocal it makes for one of the standout songs on the album. ‘Pick Me Up’ (on the deluxe version of the album only) is another great moment: the zippy orchestral arrangement is a delight, and Porter sounds more energised than he does on the beginning of the album. Porter’s original composition ‘When Love Was King’, first recorded on his Liquid Spirit album featuring a sparse piano arrangement, is reimagined with the use of the orchestra into something quite special, making it the highlight of the album. Equally pleasurable is his cover of ‘But Beautiful’, if at times the orchestra becomes a bit schmaltzy. But for the most part Porter sounds great, and much more invigorated than on the first half of the album. The most poignant moment on the album is ‘I Wonder Who My Daddy Is’, originally recorded by Ethel Ennis and later covered by Nat’s younger, equally talented brother, Freddy Cole. The song is delivered beautifully by Porter, and the lyrics clearly resonated with Porter during his youth, as he no doubt searched for his own father. On ‘Sweet Loraine’, Porter is back in comfortable territory joined by a jazz band rather than a huge orchestra. Here, Porter sounds much more like the Porter on his previous four albums: exciting and powerful. And then, to close the album, as if to really clinch the Christmas market, Porter covers ‘The Christmas Song’ – perfect for the John Lewis Christmas ad if nothing else. All in all then, Nat King Cole & Me is a mixed bag. The second half is pleasant; the first half forgettable. We’ve come to expect so much from Porter, this feels like a mis-step. After all, how many Nat “King” Cole tribute albums do we need? (Although, that said, George Benson’s Inspirational: A Tribute To Nat “King” Cole is really enjoyable – in part because it’s mostly jazz arrangements, as opposed to orchestral arrangements). At times Porter sounds restrained, perhaps to create a smoother sound, but with that we lose the magic of Porter. The album certainly doesn’t rival the excellence of Porter’s previous albums. It’s a heartfelt tribute to a man Porter clearly idolises and who was a big inspiration to the jazz singer. It’s a shame that at times Porter is drowned out by the orchestra, and at other times sounds less imaginative and less engaging than on previous releases. Porter is in part a victim of his own success: we’ve come to expect so much from Porter that this feels like a bit of a let down.